In 1997, the Israeli intelligence agency Mossad poisoned Hamas leader Khalid Mishal in broad daylight on the streets of Amman, Jordan. 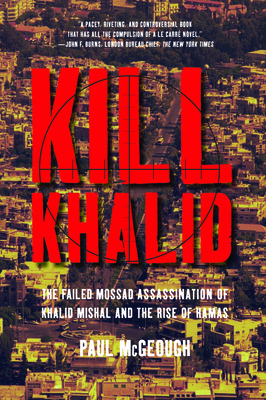 Kill Khalid is the page-turning history of this attempted assassination. Acclaimed reporter Paul McGeough reconstructs the history of Hamas through exclusive interviews with key players across the Middle East and in Washington, including unprecedented access to Mishal himself, who remains to this day one of the most powerful and enigmatic figures in the region. Paul McGeough is the chief correspondent and a former editor of Australia's Sydney Morning Herald and the author of three books on the Middle East. He has twice been named Australian Journalist of the Year and in 2002 was awarded the Johns Hopkins University-based SAIS Novartis prize for excellence in international journalism. He lives in Sydney, Australia.